Genuine Fiat Qubo Wind Deflectors. The Fiat Qubo Wind Deflectors allow you to drive with the windows in your Fiatdown without having the problem of wind travelling through your Fiat at high speeds. When the Fiat Qubo Wind Deflectors are installed they will also allow you to leave your windows open slightly to allow airflow when it is raining as any water will be deflected away from your Fiat Qubo keeping the interior dry. 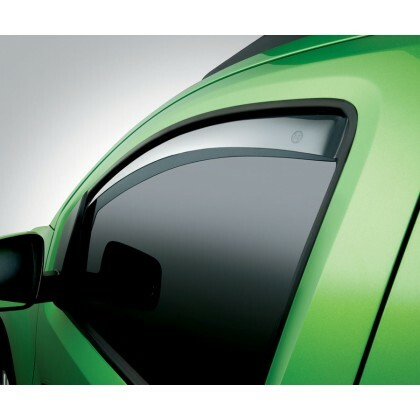 As well as these Fiat Qubo Wind Deflectors having a practical use they also add a stylish look to the Fiat Qubo. Specifically designed for the Fiat Qubo.